Okay, you're hanging at you friends and they say "Hey, let's play some D&D!" and you're all "Dude, I don't have any of my books." But then you remember you have Citadel of Evil in one pocket and your custom made wandering monsters booklet in the other. Game On! Hah, it could happen. 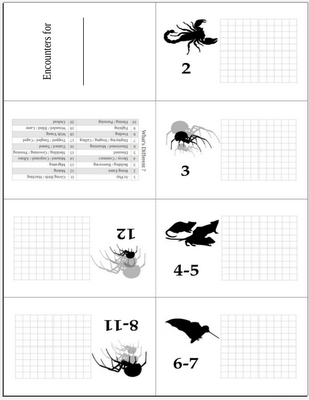 Okay, as before, this is a proof of concept-- you could put more info on each creature (dmg, AC, HD). so maybe multiple pocket mods? One for each level or section of the dungeon. Have you ever made a double sided pocket mod? I haven't, but it seems like you could. They're actually pretty easy to flip inside out. @Zak: I could certainly make pdf sheets of business-sized cards for each bugaboo. That would give you 10 rats per page. 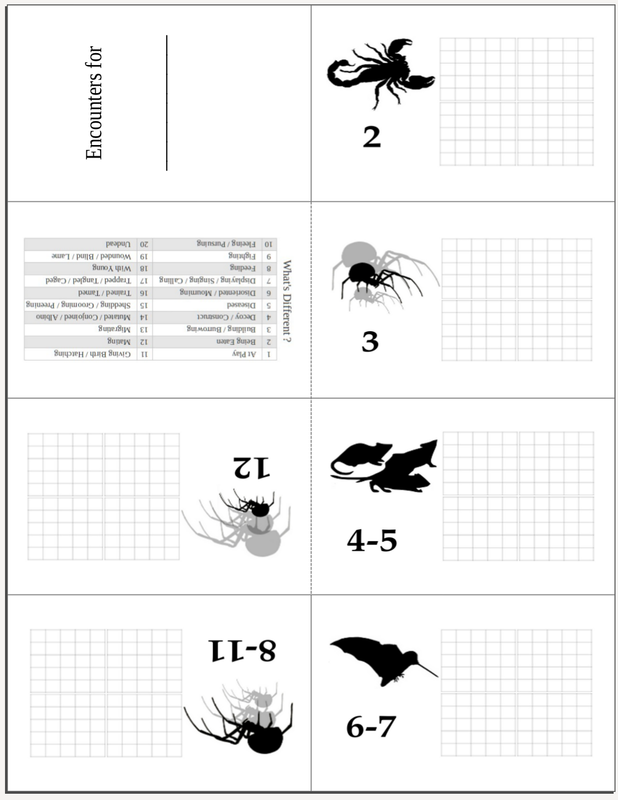 Or I could make sheets with similar monster level: 2 rats, 2bats, etc. But, like Lum mentions, I was trying to keep it flexible. If this was an actual book you'd have to flip back and forth between the pages to get to the wandering monsters you want. @Lum: Thanks. I haven't printed a double sided pocket mod but was actually just thinking about that for a multi-level dungeon. It could work, but would take a little fiddling during play. You wouldn't want to do that for a dungeon where the party is going back and forth between the levels quickly. Another possibility is a mini-sandbox on one side and six features/lairs on the other. I like the idea of using separate pocketmods for different parts of big dungeon, that lets you go for the ecosystem feel. It might get as messy as my current reams of paper affair, but if you had one booklet for your "Muck Pits" or whatever, you use it up when players visit, then print out another one in case they visit again. I'm thinking index cards, each with 6 silhouettes and a line for stats and hp boxes. If you run together 9 hp boxes for every 2 hd (or 7 when d6 are the hd) you can then draw lines and areas at will for bigger and smaller monsters. I'm not visualizing it Roger, and do you mean printing index card size cut-outs or printing onto actual index cards? Well, if the encounter calls for 8 giant rats each with 1-4 hp then 8*2.5 = 20 boxes, which you can divide up into individual "rats" as you like. And yes, I think a stack of index cards each with a mini-table could be very easy to handle. Thinking about it, they would probably have to be printed with 3 monsters front and 3 back. You can get pre-punched letter-sized sheets that separate out into index cards, no need to feed those little things into the printer.